DriDanube aims to improve drought monitoring and early warning in the Danube region with a newly developed innovative service Drought Watch (previously called Drought User Service). Since data volume and diversity from recently available satellite data (e.g. Sentinel-1 and Sentinel-2) have increased, and algorithms have become more complex, the cooperation and sharing of data has become important for the community (“Big data management”) and thus forces it to move from national to transnational level. One of the central paradigms of Big Data is to “bring the methods to the data” (and not vice-versa, which was the case until now). This is the main reason why on top of “Big data” infrastructure the methods for complex data processing will be integrated. Common methodology for drought risk assessment and methodology for impacts assessment and forecast are being implemented within the service. Both methodologies will be tailored in a user-friendly way and verified on pilot sites in the Danube region. All partners are involved in testing of Drought Watch in order to improve its usability and eliminate potential problems in the implemented functionalities. In order to maximise the usability of the service, a cascade of training events has been taking place following the peer-to-peer principle. Firstly, the project partners were trained on the main technical aspects for users of the service prototype on the regional level during the 3rd and 4th project meetings. Trainings also focused on explaining the use of methodology for drought impact assessment and forecast and methodology for risk assessment and its integration into the service. Secondly, the trainings will continue on national level, organized by project partners in all 10 participating countries to transfer the know-how further to the stakeholders. This collaborative tool is be designed to attract user community, especially national and regional environmental and emergency response authorities. They will learn how to use it through capacity building process and achieve better preparedness and have better response towards drought emergency. 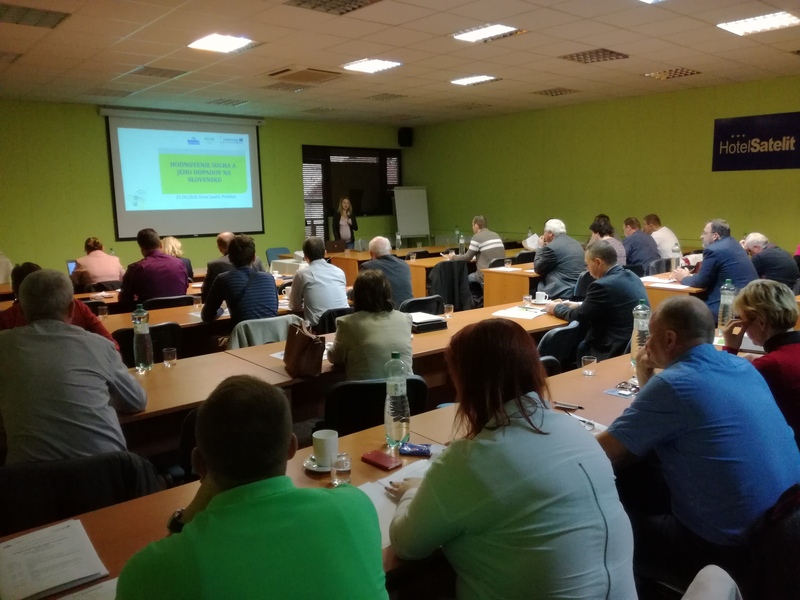 DriDanube partners in Slovakia, SHMU & GWP CEE, have started the series of national seminars on drought impact and risk assessment methodologies. The first of the national seminars „Assessment of drought and its impacts in Slovakia“ that took place on 23 October 2018 in Piestany, Slovakia was attended by 50 participants. He also mentioned that the experts are able to monitor the development of drought conditions but they need to work with practitioners from the field to monitor its impacts. For this reason they welcome cooperation with the Slovak Food & Agriculture Chamber, Ministry of Environment and Ministry of Agriculture and Rural Development who support establishment of the national reporting network on drought impacts. Mr Jan Barsvary, Director of agriculture & services unit at Slovak Food & Agriculture Chamber encouraged the participants to actively participate in regular collection of the needed drought impact data for better decision-making processes because drought 2017 losses have not been compensated yet in Slovakia. Are you interested in Drought Watch data and want to learn how to use it? Do you want to know more about integration of drought impact and risk assessment methodologies within Drought Watch? Check with our partners about the dates of the National trainings in your country.